My first attempt with the instant pot. A little thrown by the build pressure time but in the end this was fabulous. Added some extra veggies. Whole family loved it! The first time I made a recipe in the instapot and it was a success!! Very tasty and like other skinny taste recipes it did not disappoint. I forgot to buy zucchini so I used spinach like one person recommended. the only change I made was to brown the meatballs in a large sauté pan instead of the instapot. This is a keeper & will definitely make again. Thanks Gina! Made this twice now! Super easy, fast to prepare, delicious, and kid-approved! Going into regular rotation! Is it manual cook and high pressure OR soup/broth and high pressure? Is it possible to do it in crockpot? I don’t have a hot pot. Delicious but definitely took over an hour from start to finish. Your recipe says 30 minutes? This was dinner last night! I somehow missed buying basil, so I threw in some Italian seasoning. I also used 99% lean ground Turkey. The cheese and breadcrumbs really flavored up the lean meat! My toddler AND 10 month old devoured it as well! the soup looks delicious. Since I’m planning to make it soon, can you please tell me if I can make the meat balls from ground beef if i don’t have turkey available? Also, if I can use another type of pasta different from the one that you have used, will the recipe still work? Will it still taste good? I made this a few nights ago and it was delicious, just the thing for a cold, rainy, Northern California evening.My daughter was recently diagnosed with Celiac disease. I made the meatballs with some crumbs from gluten free bread and added some Italian seasoning. I browned them in a large skillet because I was too lazy to do multiple batches in the Instant Pot. I cooked the soup in the Instant Pot. When it was time to add the ditalini, I measured out a portion for my daughter and finished hers on the stove top with GF pasta. I finished the rest in the Instant Pot. It worked out well, though there weren’t GF leftovers, much to my daughter’s dismay. I may make it totally GF next time.Thank you for another wonderful recipe. Soup is great but it took me way longer than 30 min total time as it says. Maybe thats the cook time under pressure.. 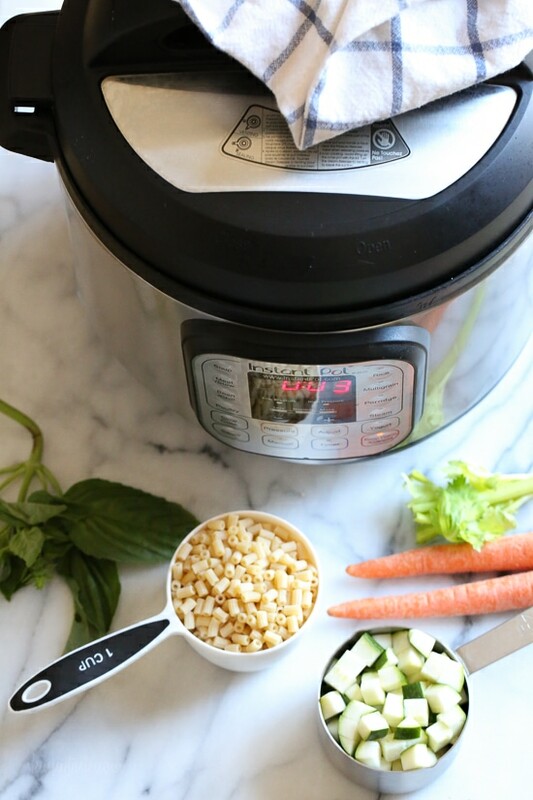 I make this on the stove – I’m scared of instant pot! This is hands down of of my favorite recipes on this site (and make a ton of recipes from skinny taste ?) 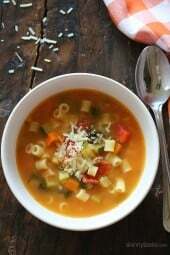 parm rinds in soup are my new favorite flavor enhacer! 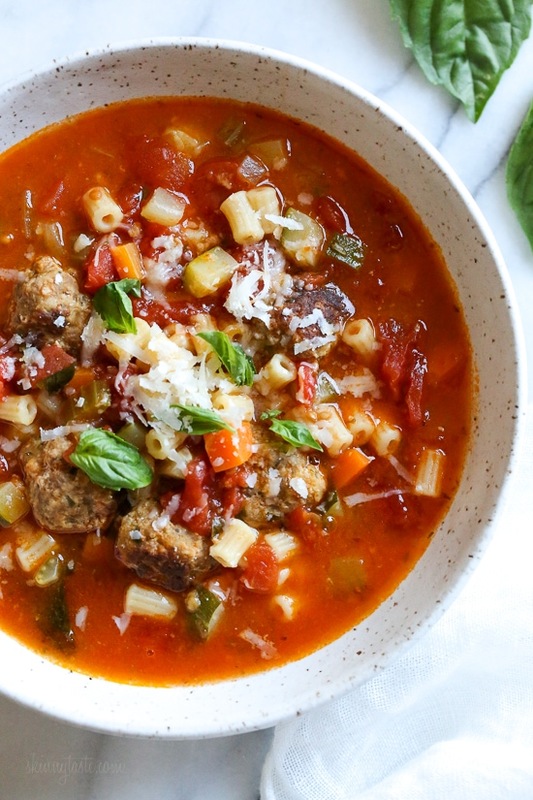 When my kids say “this tastes like a soup Mimi would make,” that’s a huge accomplishment! Thanks so much! First, this recipe is AMAZING! !I recently joined weight watchers freestyle and was so excited that I could still cook my favorite skinny taste instant pot meals, the only problem is that when I create a “food” so that I can easily add my meal, and enter the nutrition info on the weight watchers site it calculates 9 point (free style) however this recipe says 7 SP. Am I doing something wrong?Thanks! I made this last night for dinner and it was fantastic! Next time I make it though I’ll brown the meatballs in a non stick pan. They’re a little fragile and it was hard to turn them in the instapot without breaking them apart. I will be making it again though. It was delicious! The parm cheese rind gives it nice depth. Can you use 99% FF Ground turkey and reduce the points? Will the meatballs turn out with such lean turkey? I just made this recipe today and it was delicious. I did it on the stove and it was perfect and easy. Browned meatballs first, took them out, did not clean the pan and continued with the recipe as directed on the recipe with the covered pan. I added dried basil and oregano instead of bay leaf. My picky daughter loved it too! Thank you for your amazing recipes! Great recipe, as always! I do think, that I will brown the meatballs in a skillet, the next time I make it. Yes, that’s another dish to clean, but I found that, the reaching into the deep pot to try and turn the meatballs, without breaking the meatballs, is a bit too tedious/difficult. So, next time I’ll brown them in a skillet. everyone in my family LOVED this.. even my picky child that dislikes everything except eggos!!!! and re: cooking – i didn’t pre-cook the meatballs. i did saute the onions, etc., but then dumped in everything else (except zucchini and ditalini), stirred it, then plopped in my little meatballs as i rolled them. they’re small so they cook in the broth during the cook time. this was a HUGE hit in my house, thank you!! I don’t have a pressure pot but improvised and the meatballs are in the oven on a stone baking dish and the soup is on the stove in a cast iron dutch oven. I didn’t have all the precise ingredients but used what I had on hand and it looks (and smells) great! Instead of diced tomatoes I found a can of crushed instead. Added a can of canelini beans and included the liquid to thicken the soup and a handful of lentils. The zucchini and a little left over uncooked pasta I had in the cabinet is going in soon. Looks like it will make a nice hearty meal. I had extra onion and zucchini so they’re in freezer bags to use next time. Thanks so much for the inspiration! This is in my IP as I type. I’m so looking forward to the end result. Thank you. This was a huge hit with my picky 6 year old. He asked me if I would cook it every day. My 5 and 2 year olds scarfed it down also. I made it with the little wheel pasta for added kid fun. WOWZA!I have been following your recipes for the last 4 years. In college, your recipes brought me warmth & comfort as I battled through long hours of work and school and now as a young professional, I eat delicious meals that are healthy. Thank you Gina! You listened to your calling of creating tasty recipes for any skill level. Sending you gratitude for everything you do! Meghan PS: this recipe was de-lish. So much flavor! Made this recipe tonight in my IP. It was amazing!! I eliminated the breadcrumbs and egg and parsley from the meatball, using ground turkey, cheese and garlic and they came out delicious. I also didn’t have zucchini on hand and it still turned out amazing! Actually used Trader Joe’s Brown Rice GF Penne also! Definitely will be making this again!! Thank you for being amazing and creating such wonderful and delicious recipes!! I haven’t had one yet that I didn’t like! Loved this soup. We had sickness ravaging through our household so I made this in the crockpot and doubled the recipe to have it for a few days. It had SOO much flavor and everyone loved it. I forgot to add the pasta…I actually didn’t see it mentioned in the ingredient list, but I may have missed it. I will definitely make this one again!! —I didn’t even add any parmesan to the finished product. This was great! Thanks Gina! My husband and I cooked the turkey meatballs ahead of time on The stove top. And then I cooked the rest of the soup in the crockpot overnight on low for eight hours and then added cooked pasta and zucchini in the morning. It was a hit at our church potluck lunch today. Will be making again. Made this tonight. Was delicious. Families only request was to add a bit of spice next time. I’m having a hard time finding wheat ditalini. One brand I noticed listed wheat semolina in the ingredients. Is this the same thing? Thanks and can’t wait to try it out! Delicious soup!! I loved that it tastes hearty without all the calories. It reminded my boyfriend and I a bit like minestrone soup. The ability to cook in the instant pot added bonus points for me! Love this recipe! Definitely kept the pasta separate and enjoyed for lunches all week. Made this tonight. Really delicious. Can’t wait for leftovers tomorrow. Made this yesterday. II don’t own an Instant Pot, so I used the stove top instructions. I also browned my meatballs in the oven instead. Worked fine for me. It had great flavor and I’ll definitely make it again with a few changes. 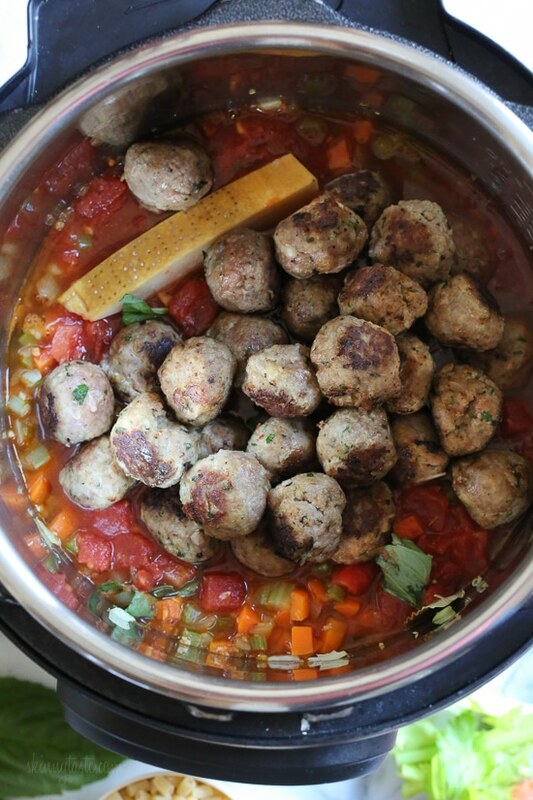 I will make my meatballs smaller, I know it said mini meatballs but I was in a hurry so mine ended up being 1″ diameter. too big for soup. Also, I will only use 1 or 2 oz of noodles. I used on 4 (recipe says 5) and it was wayyyyy too much. I know it says the liquid will continue to absorb so you may need to add water, but I added another 4 cups a broth and and 2 cups of water and it still wasn’t enough to keep it as bothy as I prefer. Lastly, I’ll add spinach next time too just to increase my veggie intake. In summary, this is a great soup. Definitely a keeper! Thanks! This was absolutely delicious, loved everything about it. Any way to lower the sodium? Yes, if you use plain bread crumbs. Or use lower sodium chicken broth. 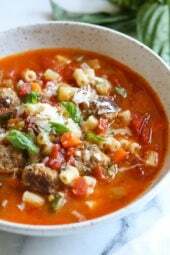 I made this soup tonight for supper and my family raved. Made it on the stovetop since I don’t own an instant pot and substituted a can of small white beans for the pasta–which Gina suggested as an option. It was delicious!! The turkey meatballs were virtually indistinguishable from beef. I made this last night an my husband and I loved it. I had trouble with the meat balls sticking when browning in my insta pot, so I just browned on the stove top. Since beans are zero points, I added pasta and beans. Delicious!Thank you for the meal plans each week.! Since there’s only two of us I don’t cook every night, but love the leftovers! Stove top directions are noted in the recipe. I use your meal plans every week! I’m a hairdresser and y’all to tons of clients each day. I have recommended your site to so many and co workers! We all love your recipes and meal plans! Keep them coming!! Great recipe! I did have a problem with sticking meatballs so next time I’ll try plopping them into the hot liquid. Also, I added the pasta into the soup and put the leftovers in the fridge. The pasta soaked up most of the broth overnight so next time I will keep the pasta separate and add some to each bowlful. If swapping out white beans for the pasta, when should those be added? Before cooking for 15 min or afterwards, along with the zucchini? I made this on the stove top and it was excellent. Great for leftovers too. I used a small bit of oil to brown the meatballs, which worked for me much better than spray. I didn’t have grated parm so I used shredded Romano in the meatballs. I also made the meatballs very small. Used higher amount of veggies than called for. This soup was DELICIOUS! I used lean beef instead of Turkey. The meatballs were so tasty and easy to brown in my Instant Pot. Thanks! This recipe is fabulous. Made it Ion the stovetop. 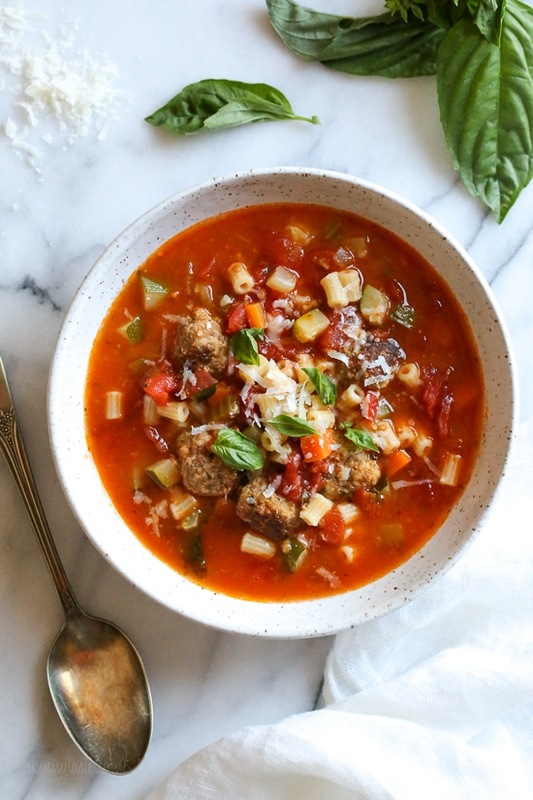 I have tried everyway I know how to pin this but I cannot do so….very frustrating as I want to make this soup tonight ???? Excellent recipe! My husband and I are now fighting over the leftovers. You can’t turn them so fast, they need to brown and when they easily move then turn. Also make sure you cook in batches. 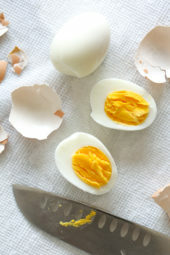 Refrigerate for up to 5 days, or freeze for up to 3 months. To reheat, defrost overnight in the refrigerator, then heat on the stove. You can freeze without the pasta and add when you reheat if you wish. If you substitute the white beans for the pasta, do you need to drain and rinse the beans? I made this with extra veggies and the Weight Watchers couscous and it is AMAZING. I love so many of your recipes! Thank you, Gina! How long do you have to brown the meatballs before they don’t stick!? I feel like i could be here all day..surprised no one else has commented. Might just skip the browning stage! Nevermind! Tried again and I think the trick is to wait until the pot is hot before dropping them in; that or at first I used Trader Joe’s olive oil spray, but then tried PAM which seemed to work much better. I also needed to use much more breadcrumbs than called for in order for the meatballs not to stick. Substituted the pasta with white beans and it came out beautifully! Freezing my leftovers! Hi. I can’t wait to try this recipe this weekend. I just want to double check that the tomatoes you used were diced and not stewed? Thank you! How many servings does this make, because my husband was ready to eat the whole thing! It was delicious.To keep it more keto, I left out the pasta– the zucchini was nice to have something floating like pasta. I bought meatballs at the meat counter at Whole Foods and that saves a lot of time. Browning them was worth it. I thought they might be tough from so much browning, but cooking them in the soup made them deliciously tender! This will probably become a weekly treat! Thanks. Another winner recipe! Been a fan for years and have gotten many others hooked on your nutritious and delicious recipes. Do you have any instant pot dessert recipes such as carrot cake or cheesecakes in the works?I wish that Tottorosso were sold here in Canada but I have never seen them in any stores. For my fellow Canadians, I highly recommend using Fire Roasted Diced Tomatoes as an alternative. Also, Better Than Bouillon bases makes for awesome rich and flavourful broths. I made this for dinner tonight and it was delicious! I love the calorie count and it made enough for leftovers for lunch/ dinner over the weekend. One serving was very filling, Thank you for sharing this! This soup is delicious! Will definitely make it again. not sure, that does not effect the time you press on the machine. Is the pasta cooked/uncooked when you add to recipe? I agree! The time given was deceptive! Absolutely delicious! I didn’t have zucchini on hand, so I threw in spinach instead. I wonder how the points would change with 99% Fat free turkey. 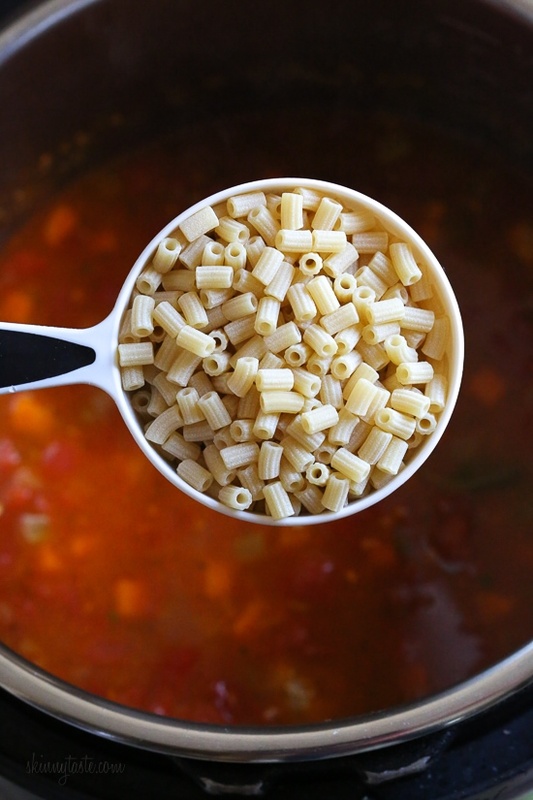 There is an asterisk after “5 ounces ditalini pasta (1 cup)*” — to what does this asterisk refer? About how long did it take you to brown each batch of meatballs? I baked my meatballs in the oven at 400F for roughly 22 minutes. This way I was able to cook them all at once. Delicious too! I am a pretty good soup maker but this is the most delicious soup I have made in ages. Counting WW points but it was really hard not to have a second bowl. Hi, how many points do you think it would be if you took out the pasta? Sorry don’t have that info handy. Yes, I would bake or broil the meatballs so they hold their shape, cook on low 8 hours, add the zucchini the last hour and cook the pasta separate. 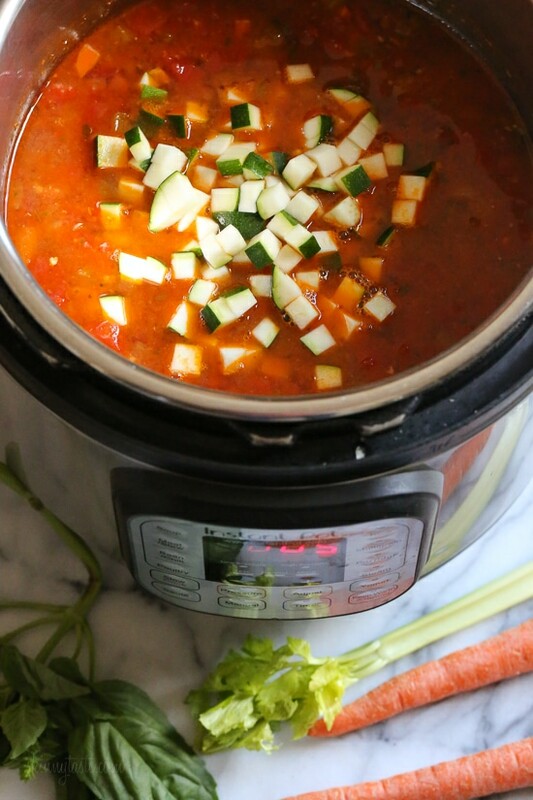 Do you have to use an instant pot for this recipe? Could you use a crockpot or stovetop? Stove top directions are in the narrative. For the slow cooker I would bake or broil the meatballs so they hold their shape, cook on low 8 hours, add the zucchini the last hour and cook the pasta separate. Can I use frozen turkey meatballs? And can I make this in slow cooker? 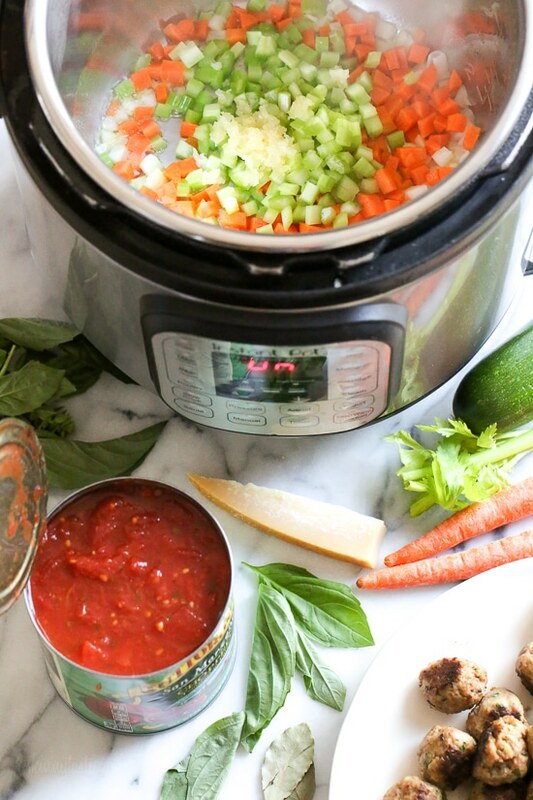 This looks yummy, do you have a slow cooker recipe ? Did you click the print button near the ingredients? It’s not useless. That’s extremely rude. Gina works extremely hard on the website, recipes, and books. Seems like it was a user error. I had no issues at all! I’m on WW and I’m wondering how much lower the points may be if you substitute the white beans for the pasta. Any idea? “Linda” replied 5 free style points/serving if substituting white beans for pasta. 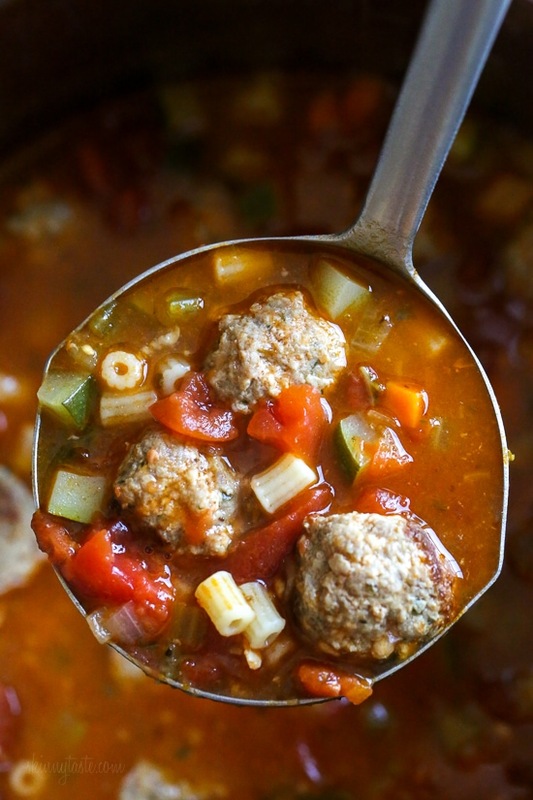 Could you make this with precooked turkey meatballs? Can this be done either in a slow cooker or even on the stove? Can I make this in the Instant Pot Mini? If it fits, maybe half? How many points would it be if you substituted beans for pasta? 5 oz of ditalini pasta is 15 Freestyle points. Beans are 0. So after doing the math, each serving would be 5 freestyle points with the substitution of beans for pasta. @Gina, can you concur that this is correct? Hi Gina! This looks amazing. Perfect for an icy day near Philadelphia! Thank you for all the instant pot recipes! You are my go to for recipes using my new favorite item! Hi Gina, Love your recipes! Can this be made on the stove top ? Yes, stove top directions are in the narrative. How do I find the narrative ? This recipe looks delicious & I can’t wait to try it. You might want to add : remove the bay leaves before serving. Hi Gina. Can you make the meatballs in advance and freeze them? If so freeze the meatballs uncooked or cooked. Thanks!! Does this come out ok when cooking on stove top instead of insta pot? Should I brown the garlic first or can I really just put it all in the pot on the stove (less the pasta and zucchini as noted)? Yes its great, and no need to. 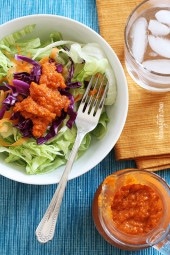 Hi Gina, I am new to your site and am loving your recipes so far.! I’m from the UK, and was wondering if you have conversions from cups to grams? All your recipes list cups of ingredients but we work in grams ???? Can I make this in the mini instant pot? It only holds 3 qts? No. We just tried and it’s too much. We had to pull out the 6 qt! Hi Gina, can you tell me which instapot you have? Thanks! Made this tonight! SO good! Thanks for yet another hit, Gina!!! Can this be made any other way, …rather than the Instant Pot?? I do not have one but would love to make this…it looks delicious!!! Yes stove top directions are in the narrative and for the slow cooker I would bake or broil the meatballs so they hold their shape, cook on low 8 hours, add the zucchini the last hour and cook the pasta separate. Excellent soup! Everyone had seconds! Look great! When you add the pasta and zucchini to the Instant Pot and cook 4 more minutes, do you mean 4 minutes after it gets to the correct pressure again? You press 4 minutes. Don’t worry how much time it takes to get to pressure. I’m confused about this also. When you press 4 min does it go back up to pressure though? Yes, don;t worry about the time it takes to go to pressure, just press 4 minutes. Hi ! I’m new and I’m confused with the points. You have two beside the recipe and I don’t know, is it joined points or one or the other ? The new program uses freestyle points. The old points plus is the other you see. Looks delicious! Can this be made in the crock pot? Directions list tomato paste for the meatballs but does not list it in the ingredients. 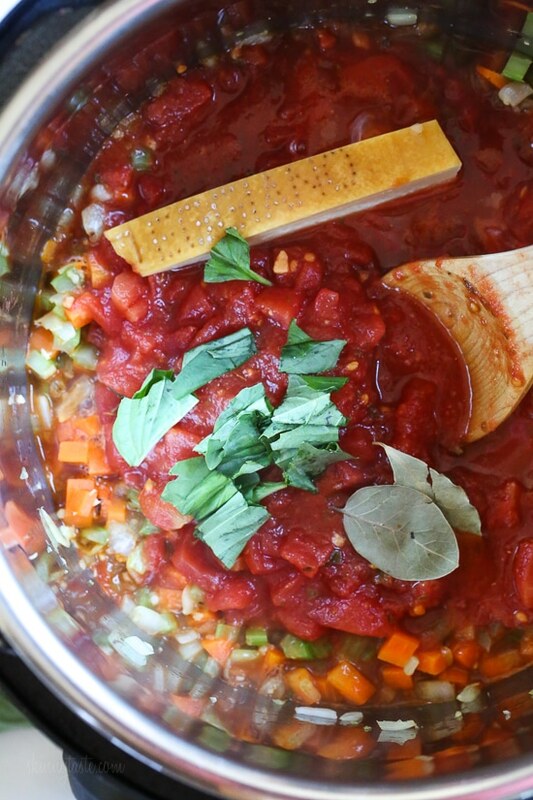 Do you use tomato paste, if so, how much? Love all your recipes! There hasn’t been one that wasn’t a hit at my house. I have been looking for your Revised Meal Planning Cookbook and sadly cannot find it anywhere. Do you have any suggestions? I appreciate it! Have a great day. Thank you! It is going to be available in April, sorry for the delay. I see that you have tomato paste in the meatball directions but I don’t see it in the ingredient list? How many meatballs did you factor per serving to reach the calorie estimation? This looks awesome!!! If you make 30 meatballs you will get 5 each. I have been making some of your recipes and they are so amazing I don’t know how you do it! So fresh and healthy and the best soups ever !! 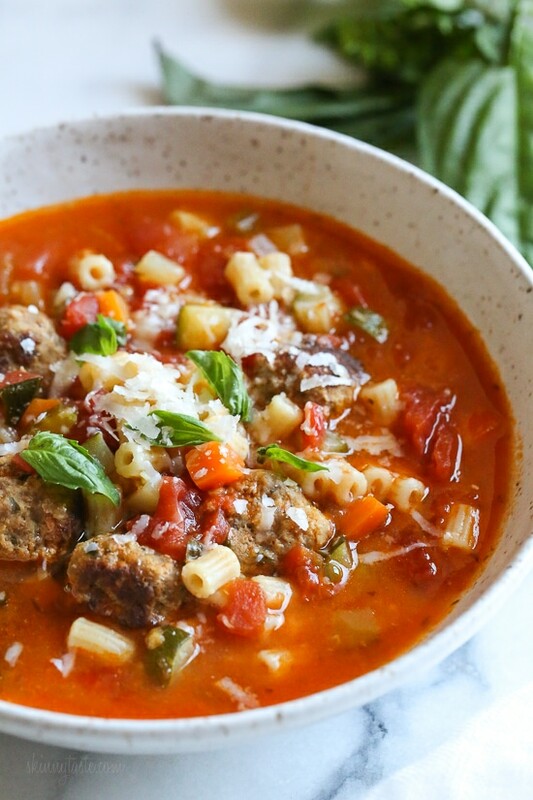 So far I made the garlic knots, zucchini soup and this Italian meatball is on the stove I’ll make everything it all looks great !! Keep up the great work Gina much appreciation !